After reading from Marketmanila about the Balamban Lechon Cebu, I decided that it will be easy enough to copy the recipe, and adjust to the way we prepare it, and to what I think will work. I read through all of his different styles and made up my own (as usual). 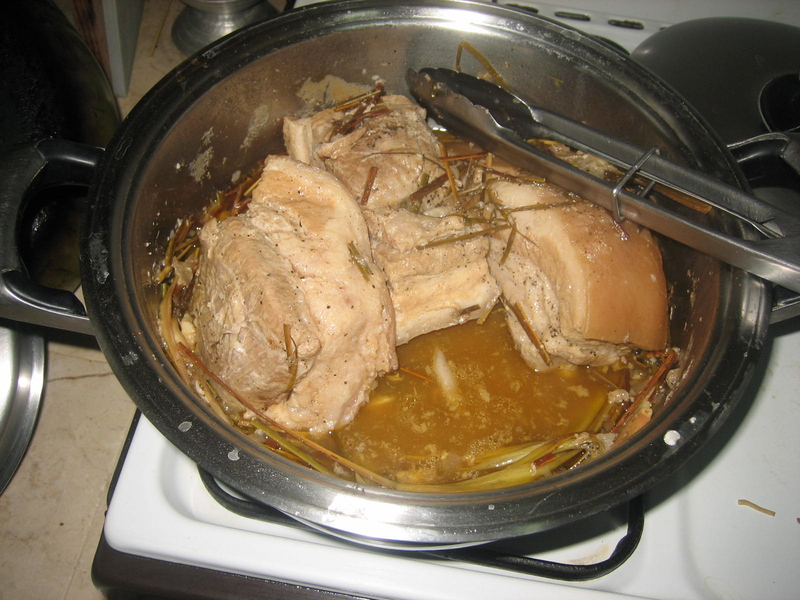 It was a cross between getting his flavors and combining our usual lechon kawali style of preparing. 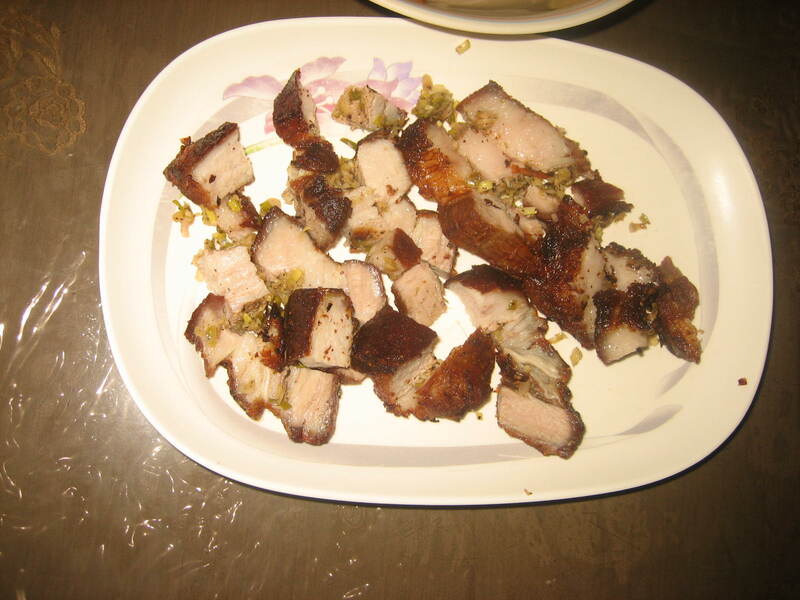 For all those not in the know, lechon kawali is a deep fried version of the usual lechon which is roasted-in-the-spit pork we Filipinos usually have during fiestas or grand parties. Literally, it translates to roasted pig in a pan, meaning, the pork comes out with the same crunch of the lechon (albeit different texture) and the same tender goodness for the meat, but without the whole pig or the spit. 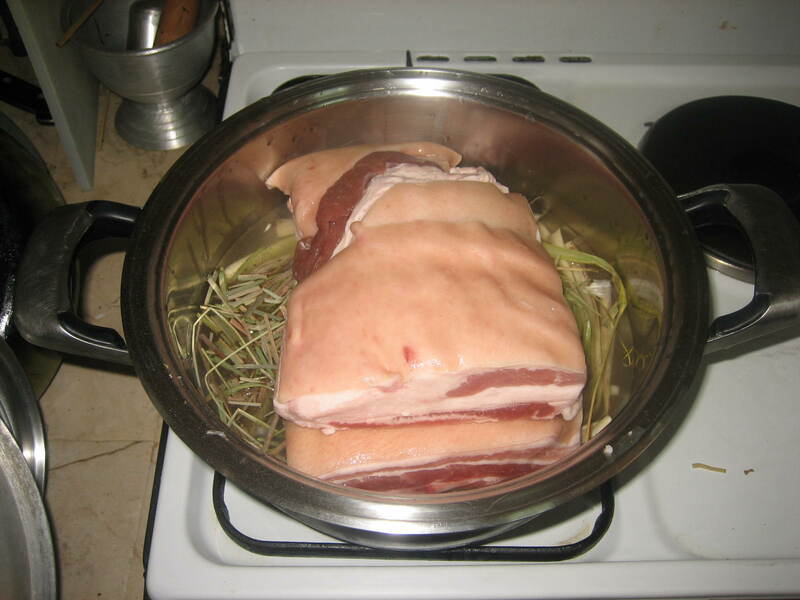 The typical way we prepare lechon kawali at home is to boil the meat with salt and pepper, then deep fry it. That’s it. Simple enough. You can do big batches at a time of boiling the meat, then just refrigerate everything else for use at a later time. I have no complaints whatsoever for the lechon kawali, but imagining it tasting the same way a lechon cebu tastes like, ahhhh, that’s heaven. Reading from Marketman, he used some sinigang (sour soup) mix which I totally love. Growing up, I hated sinigang, and would always request that some of the meat be fried so I can eat (which I still prefer up to now). So the lechon kawali would be reminiscent of that taste. 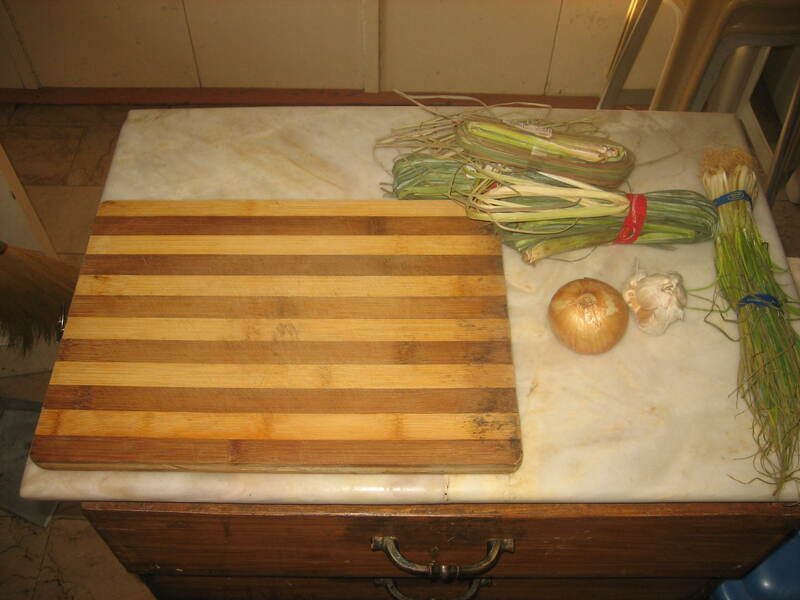 He also recommended the use of tanglad (lemongrass) and spring onion. I also added some garlic, onion, salt and pepper. I put the meat in, and added a bit of water. Off to a boil to soften and cook meat completely through. 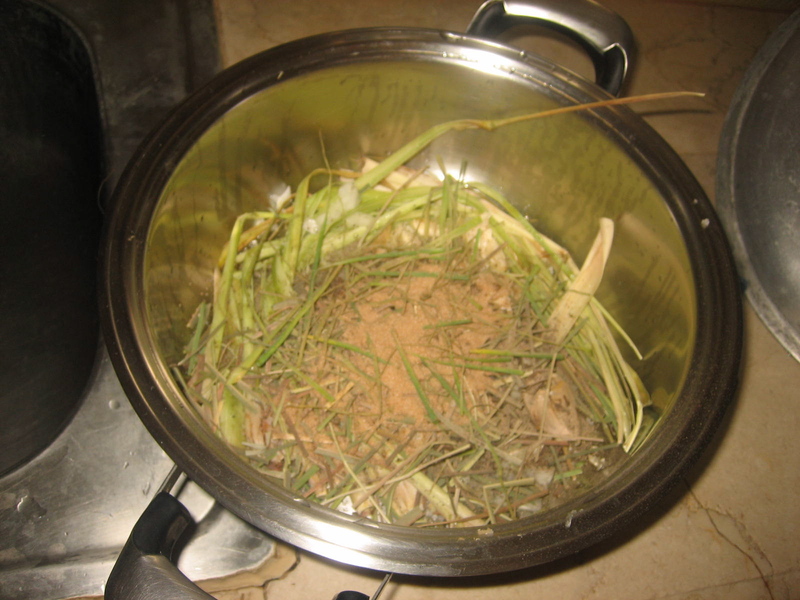 As an afterthought, you can use fresh tamarind for the sinigang mix. Just add more salt. I just waited until the meat was done before removing it from the fire. I had to taste the broth left behind to see how much salt was in the mix. It tasted too salty for me, and I figured, I seasoned it enough. But eventually, I would find out later, that the salt was still lacking. Since this was only a trial, I was a bit hesitant on doing the next step on everything. Luckily, it would only be me and ate (plus Jarell, ate Pines and Lilet) who would be having lunch, so doing just one slab for frying was perfect. I liked the idea of stuffing the flavorings inside, figuring that if anything fell out, well too bad. Marketman had a raw meat to stuff with, mine was cooked. I decided on stuffing it with more of the flavors that I boiled it with: lemongrass(only the edible part), spring onion, sinigang mix and pepper. I chopped the greens into tiny pieces and mixed in the seasonings. I stuffed the mix into two cavities I made in the meat and tried to seal the opening with my fingers. Stuffed and ready for frying, you can't even see the opening! Into the fryer it goes (care of ate Pines) and it came out golden brown! I requested that it not be hard fry like the regular lechon kawali so that the meat will remain tender, though I think it ended up being under-fried. Sliced into bits, partnered with rice. I ended up using the flavorings as my sawsawan (dipping sauce) though it was a dry mix. Next time, I will add more salt, fry longer and hotter. Happy with the initial try 🙂 and just like the inspiration of the Cebu Lechon, hopefully, it will become so good that there’s no need for a dipping sauce. Boil the meat in mixture of crushed whole lemongrass (even the long green stalks), 2 diced onions, chopped stalks of spring onion, tons of salt and pepper, crushed garlic and half of the sinigang mix. Add a bit of water to about halfway of the pork. Let it cook through. Cool. 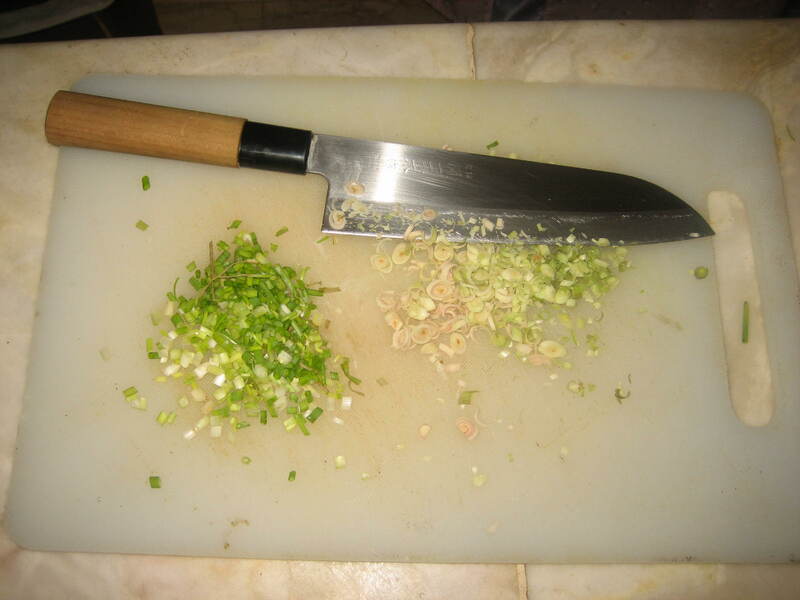 Diced the lemongrass and spring onion, and season the stuffing with more sinigang mix, salt and pepper. 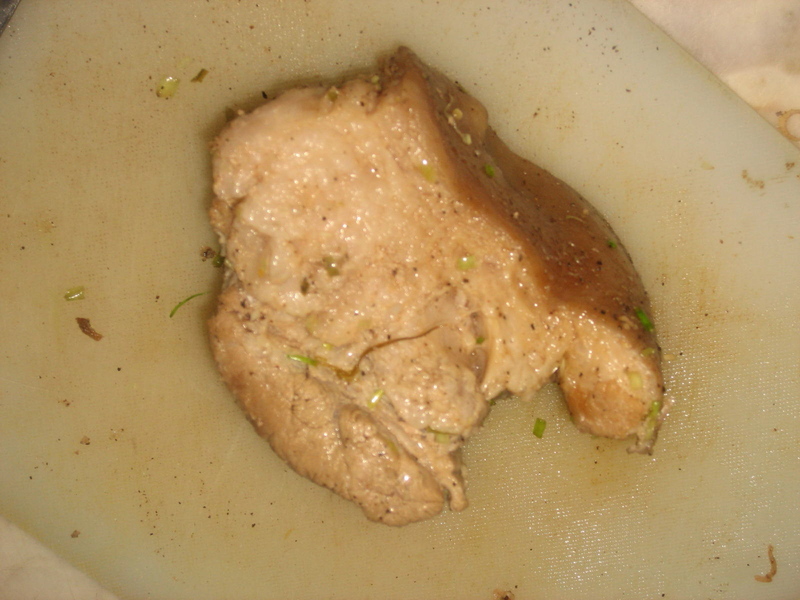 Cut into the pork by inserting a steak knife (or any long thin knife) and move it around a bit. Make sure you can get your fingers through. It’s a messy job, but gently stuff the pork with mix. Deep fry! Chop and serve! Voila! I never thought that we can make lechon kawali taste like Cebu Lechon. After work I’ll visit the supermarket and buy some ingredient, I’ll be cooking this recipe for tonights dinner. It is a bit of an experiment that turned out really well I think 🙂 good luck on your experiment! 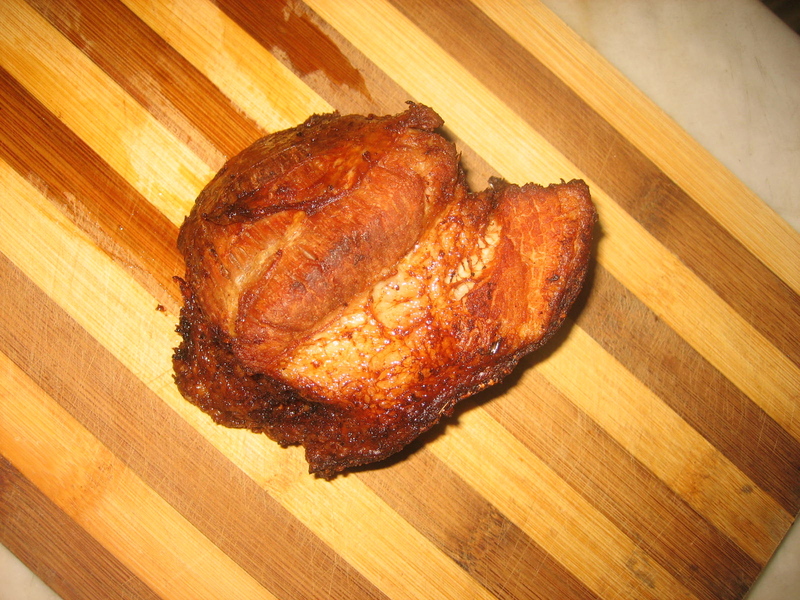 I’ve heard the key to a crispy lechon kawali is to freeze it for an hour after boiling it. I’d like to try this process too and see how it goes.